These commands vary somewhat, depending upon your system, since the GIMP makes calls to system functions. When you copy a selection, it goes into the clipboard. Then you can create a new image with it. This command has the same action as the Paste as / New Image command. The Print Screen keyboard key captures the screen and puts it in the clipboard. 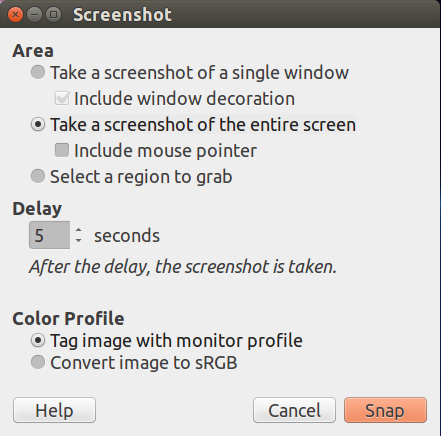 This command has the same action as “taking a screenshot of the entire screen” in the Screenshot dialog window. 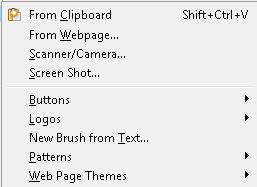 The Alt+Print Screen key combination grabs the active window in the screen with its decorations and puts it in the clipboard. This command opens a dialog where you can enter the URL of a Web page and get the image in GIMP. The command defaults to gimp.org. Please have a try to it. The mouse pointer becomes a cross. Click in the image window you want to capture. A new image is created. If the Include window decoration option is unchecked, the title bar and the blue frame around the image will be removed. This is useful if you want to capture a pop menu. A delay is then necessary, so that you have time to pull the pop menu down. If the Include mouse pointer option is checked, then the mouse pointer and its coming with icon are also captured. The mouse pointer is captured in a separate layer. So you can move it to another place in the image. The mouse pointer becomes a cross. Click and drag to create a rectangular selection in the image window. This selection will be opened as a new image. Its size is adapted to the selection size. When taking a screenshot of the entire screen, the screen is captured after this delay. In the other cases, the mouse pointer turns to a cross after this delay. This item is present in Windows operating system, using TWAIN. Image input devices appear in the dialog, if they are plugged-in. On Linux, you need to install third-party XSane plug-in which will be available in the File → Create → XSane → Device dialog… menu. The kinds of devices used to take pictures are too varied to be described here. Fortunately, their use is fairly intuitive. 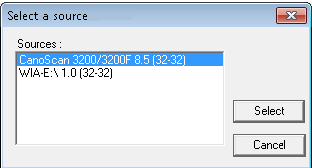 In the example shown (under Windows 7), you can start a scanner or load an image from a camera card. An impressive list of Script-Fus. Have a look at it!